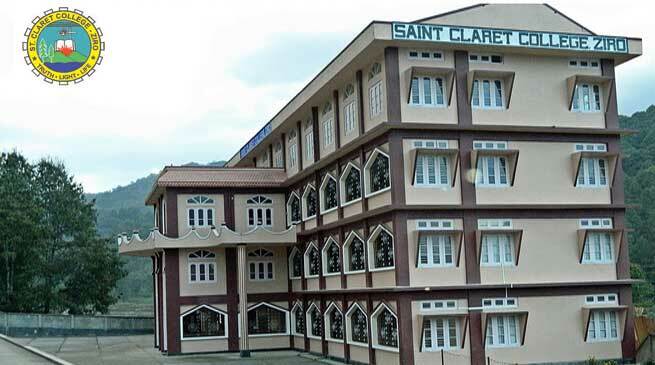 The Re-Visit to Saint Claret College, Ziro, by a fresh Peer Team from the National Assessment and Accreditation Council (NAAC) concluded on Saturday with the solemn Exit Meeting. The Team consisted of Prof. Asish K. Roy, former vice chancellor of Kalyani University, Kolkata (Chairperson), Prof. Jugal Kishore Mishra, Former Professor of Political Science at Berhampur University (Member Coordinator), and Dr. Kumar Sanjeev, Principal of Dr. G. B. Teachers, Training College, Bihar (Member). Being a re-visit, the team was accompanied by the NAAC Coordinating Officer, Prof. H. K. Anantha Subba Rao. In May 2015, Saint Claret College had become the first private college in Arunachal to be accredited by NAAC. However, the College community was left disappointed by the modus operandi of the visit by the then Peer Team and the Grade Point Average (GPA) it awarded. Being convinced that the college deserved a much better and fair assessment results, SCCZ appealed to NAAC for a review. The NAAC accepted the review appeal and a re-visit by a fresh team was ordered. The re-visit began on November 10th and ended today. As per the protocol, the Peer Team visited all the facilities and support systems of the college and attended report presentations by the principal, the Internal Quality Assurance Cell, and all departments. They interacted with the parents, alumni, students, staff, governing body, university and government representatives and were deeply impressed by the appreciation and support the college has from them. Tage Taki, MLA, met with the Peer Team and conveyed his appreciation for the excellent educational services by the College. Handing over the Peer Team report at the final Exit Meeting, Prof. Roy expressed happiness at the rich and diverse achievements of the college over such a short span of time, the strong bonding within the academic community, and the good rapport with the stakeholders. He conveyed the unanimous appreciation of the Peer Team for the college, but recommended that the faculty must engage in more research taking the college to greater heights. Prof. Subba Rao, the NAAC official, commended the college for its tradition of excellence and wished it a bright future. They were deeply impressed by “Spirit of Arunachal” cultural show by the Claretines. For the college, it was a long and gruelling long years of hard work for the accreditation, especially with the re-visit order, but at the end of it all, the staff and the students felt that it was an effort worth committing to. The declaration of result is expected in December.